Portrait of Bose Ikard. Image courtesy of PBS. Image available on the Internet and included in accordance with Title 17 U.S.C. Section 107. IKARD, BOSE (1843–1929). Bose Ikard was born a slave in July 1843 in Noxubee County, Mississippi, and became one of the most famous black frontiersmen and traildrivers in Texas. He lived in Union Parish, Louisiana, before his master, Dr. Milton Ikard, moved to Texas in 1852. Several months later Bose helped Ikard's wife, Isabella (Tubb), move the family's belongings and five children to their new home in Lamar County and soon afterwards to Parker County. The young slave grew to adulthood with his owner's family, learning to farm, ranch, and fight Indians as the Civil War drew near. The war left Bose a free man, and in 1866 he went to work for Oliver Loving as a traildriver. After Loving was killed by Comanche Indians in New Mexico, Ikard continued in the service of Loving's partner, Charles Goodnight, for four years. The two men became lifelong friends. Goodnight later commented that he trusted Bose Ikard "farther than any living man. He was my detective, banker, and everything else in Colorado, New Mexico, and the other wild country I was in." 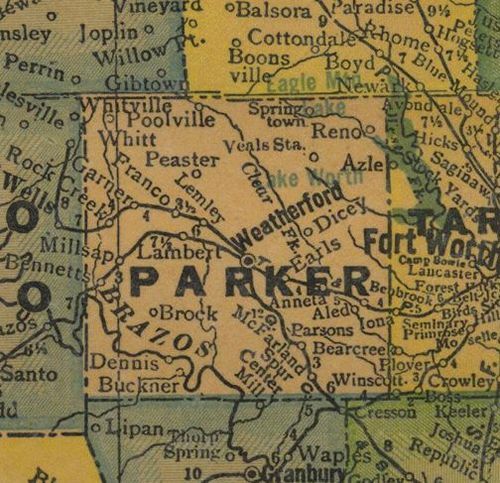 Map of Parker County, 1940s. Image available on the Internet and included in accordance with Title 17 U.S.C. Section 107. In 1869 Ikard wanted to settle in Colorado, but Goodnight persuaded him to buy a farm in Parker County, Texas, because there were so few blacks in Colorado. Ikard settled in Weatherford and began his family at a time when Indian attacks were still common in North Texas. In 1869 he participated in a running battle with Quanah Parker's Comanche band, riding alongside his former master, Milton Ikard. Bose married a woman named Angelina in 1869 or 1870, and they had fifteen children. In his later years he attended several cowboy reunions. Goodnight visited him in Weatherford whenever the opportunity arose and gave him presents of money. Ikard died in Austin on January 4, 1929. After his burial in Greenwood Cemetery, Weatherford, Goodnight bought a granite marker and wrote an epitaph for his old friend: "Bose Ikard served with me four years on the Goodnight-Loving Trail, never shirked a duty or disobeyed an order, rode with me in many stampedes, participated in three engagements with Comanches, splendid behavior." J. Evetts Haley, Charles Goodnight (Norman: University of Oklahoma Press, 1949). Handbook of Texas Online, Joseph Andrew Blackman, "IKARD, BOSE," accessed April 24, 2019, http://www.tshaonline.org/handbook/online/articles/fik03.